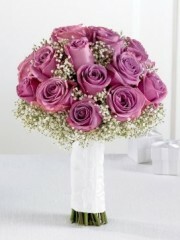 Blooming with majestic charm, this beautiful bouquet is set to add that extra touch to your wedding style. Lavender roses are offset by purple larkspur, purple double lisianthus, lavender monte casino asters and Queen Anne's lace to create a fantastic display of floral beauty and elegance. Approx. 20"H x 10"W.
Lavender and purple anemone blooms will capture everyone's attention with their bold hues. 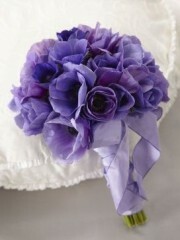 Tied together with a lavender taffeta ribbon, this bouquet is the perfect accompaniment to your trip down the aisle. Approx. 10"H x 8"W.
Nothing says love and romance more than a bouquet of classic roses and this large-headed variety are a beautiful choice. The lavender colour is distinctive and feminine, and works perfectly when hand-tied with pretty gypsophila to create this gorgeous bouquet. The True Love Boutonniere is a distinctive piece blooming with soft sophistication. 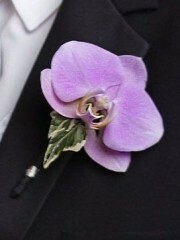 A single lavender phalaenopsis bloom is accented with variegated ivy to create the perfect look for your groomsmen. 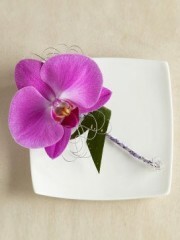 These orchid petals in rich purple, delicately edged with white are both elegant and beautiful. This is a corsage that is sure to be worn with pride and will co-ordinate wonderfully with so many different outfits and colour schemes.Featuring a purple dendrobium orchid stem finsined with cream satin ribbon. 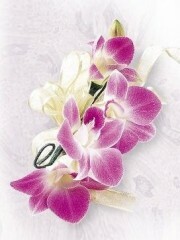 This corsage is approximately 10cm (w) x 18cm (l). This Exotic Orhcid Garland is a tropical way to celebrate your wedding day. Perfect for themed weddings or one set on the beach or a beautiful island, the garland of cerise double dendrobium orchids is a fantastic way to add to the festivities. Approx. 36-inches in length. 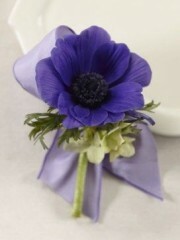 The Purple Passion Boutonniere is a gorgeous accent piece for your groomsmen. A single purple anemone stem is accented with green mini hydrangea blooms and lavender French taffeta ribbon to create a distinguished look. Approx. 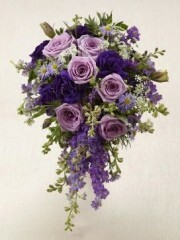 4"H x 3"W.
This bouquet is a charming display of lavender beauty. Stunning lavender roses and lilac are brought together to create the perfect look of graceful elegance while exuding a soft fragrance, tied together with a mauve satin ribbon. Approx. 8-inches in diameter. 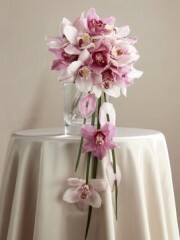 Lavender and pink cymbidium orchids are carefully arranged to form an impressive display accented with lily grass blades and galax leaves holding additional orchid blooms beautifully suspended from the bouquet. Presented in a silver metallic bouquet holder, this arrangement will hold their attention as you take your steps down the aisle. Approx. 18"H x 10"W.
Our True Happiness Bouquet speaks of garden grandeur and sweet romance. 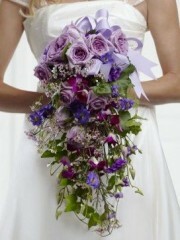 Lavender roses are positioned at the top of this cascade bouquet which features pink dendrobium orchids, pink waxflower, lavender mini carnations, purple delphinium and ivy vines elegantly suspended to create a fantastic look. Tied together with a lavender grosgrain ribbon. 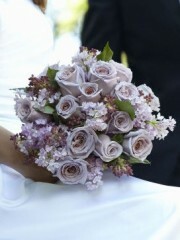 The Soft Lilac Boutonniere has a look of charm and elegance to complete the look of your wedding party. A single lavender rose is accented with lilac, green ti leaves, and a mauve satin ribbon to add to your wedding day style. 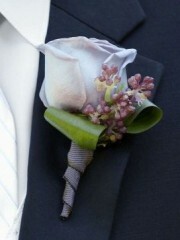 The Opulence Boutonniere is an elegant way to bring a soft sophistication to the overall look of your wedding party. A single fuchsia pink phalaenopsis orchid bloom is accented with fresh greens, lavender French taffeta ribbon and silver and purple wire to create a noticeably dramatic look of elegance. 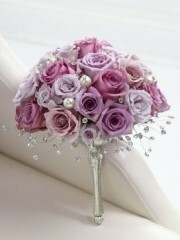 The Opulence Bouquet has a dramatic flair of elegance that won't go unnoticed. 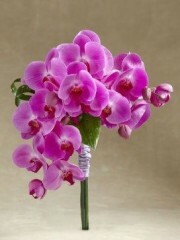 Fuchsia pink phalaenopsis orchids are accented with lush greens and tied together with a lavender French taffeta ribbon to create an impressive display of floral beauty. Approx. 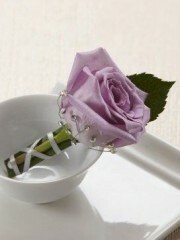 15"H x 11"W.
The Blissful Love Boutonniere is the perfect way to complete the look of your wedding party. A single lavender rose is accented with a lily grass blade, rhinestone spray pics, pixie pearl pins and a silver grey French taffeta ribbon to create a sophisticated and distinguished look. Approx. 3"H x 2"W.
The Enlightened Love Pomander is sweet alternative to a bouquet. 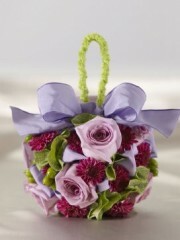 Lavender roses, purple button pompons, green hypericum berries and mollucella are arranged in the shape of a perfect ball accented with a lavender French taffeta ribbon at the top and intended to be held from an apple green chenille wire. Approx. 5-inches in diameter.